Bright,sunny front to back living room. Dining room from kitchen view. 1st Queen bedroom (new pillowtop mattress) ocean breeze. 2nd Twin bedroom (new pillowtop mattresses) cathedral ceiling. Upstairs full bath travertine-tile/glass shower door. 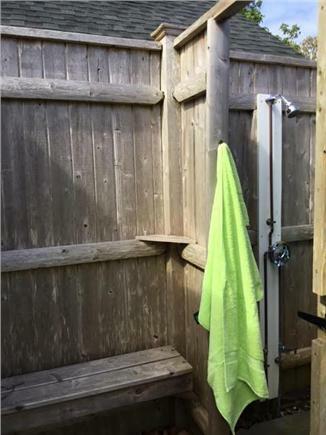 Oversized outdoor shower with changing room! 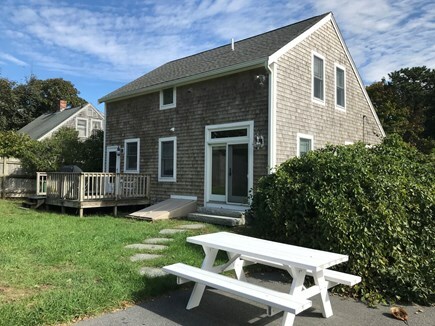 Newly renovated bungalow 9' ceilings downstairs,in a quaint, quiet and relaxing Harwichport neighborhood. A few blocks from Route 28 shops and restaurants. Chatham is a 10 min drive. 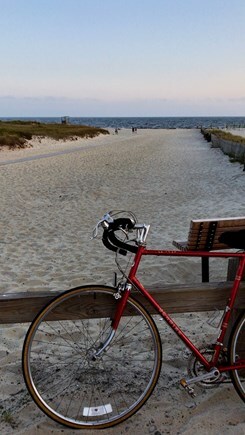 A half mile walking distance to Bank St. Beach and Sea St. Beach. Bike path in Harwich Center, and golf course. This 4 BR home sleeps up to 8 with 2 queen beds and 4 twins. It has 1 1/2 baths with an outdoor hot and cold shower. Comfortable for family of 5 or 6 . Enjoy the front porch for relaxing in the morning or afternoon. Ceiling fans in each bedroom along with the ocean breeze keep the house cool along with central air. This is a family, non-smoking home rental, pets of any kind are not allowed. *Oversized outdoor hot and cold shower has adjoined changing room with bluestone flooring. Comfortable for showering anytime of the day ! Additional pricing info: All additional fees included( cleaning, trash removal), State and local taxes of 12.45% will apply. We have stayed in this home for 2 consecutive years and plan on making it our regular rental. This home is great for our 8 yr old twin boys with a large yard, basketball hoop and quiet neighborhood. I love that we can walk a few blocks for coffee every morning in the town center and re-visit in the evening for drinks and dinner. I grew up spending summers at Bank St beach, so the proximity to the beach is one of our favorite things about his house.